Don’t you just love colorful veggies!?! Beetroots are full of rich color which indicates lots of phytochemicals and antioxidants. They are great for blood and heart health as well as digestion and improving athletic performance as it helps oxygen flow to muscles. Beetroots are also a rich source of folate and manganese along with other important vitamins and minerals. 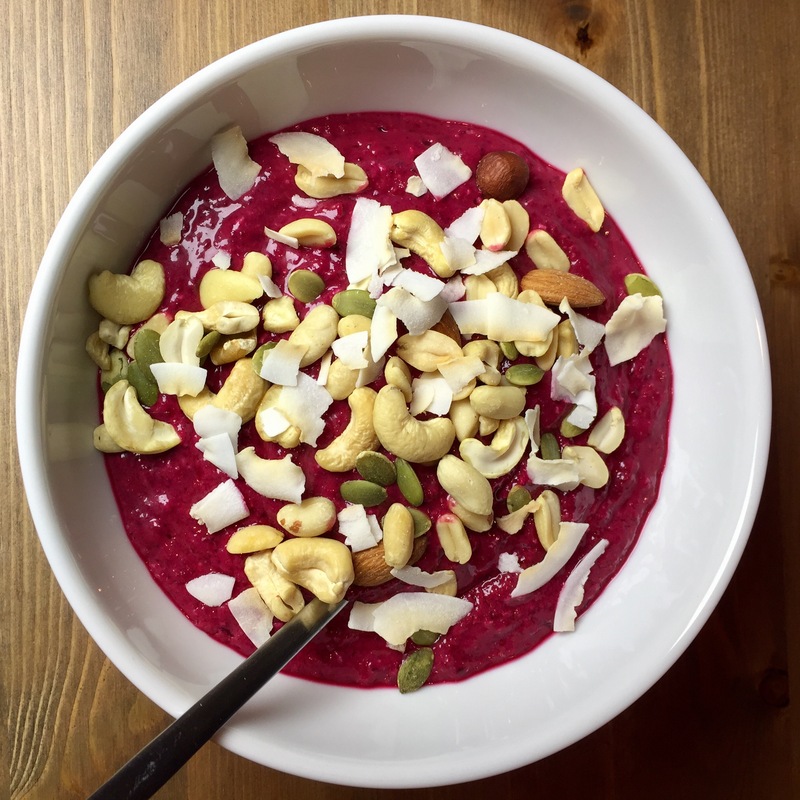 An easy way of incorporating beets into your diet is by making this colorful beetroot smoothie, either for breakfast or as a snack before/after a workout session. Sometimes this is our evening meal if we have had a large filling lunch. Optional add-ins: spices (cinnamon, turmeric, vanilla etc. ), avocado (for extra good fat), raw egg (for extra protein and fat), collagen, protein powder or any other super powder you like. I like to add some pieces of frozen green banana to make the smoothie more creamy, almost like ice cream. Wash the beets and cut off the ends, if they are organic I leave the skin on for extra nutrition. Same goes for the ginger, if it’s organic I just wash it and don’t peel it. Start by mixing everything apart from the frozen ingredients in a blender. Add the frozen ingredients and blend again. Just add more water if you like your smoothie less thick. Top with your favorites such as nuts, seeds, coconut flakes, cacao nibs, berries etc.